Numerous scientific publications explore the field of gastrointestinal (GI) endoscopy (a Pubmed search currently yields >73000 results). Therefore, guidelines have become an indispensable tool for incorporating up-to-date knowledge into daily clinical care. Since the 1990s, the issuing of guidelines has been a central task of the European Society of Gastrointestinal Endoscopy (ESGE). 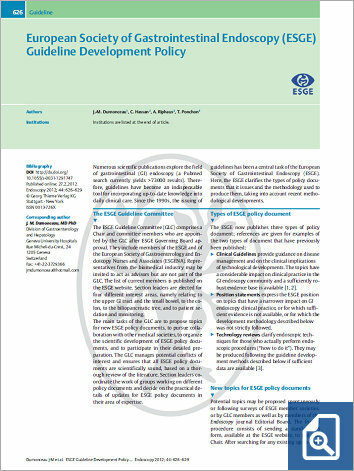 Here, the ESGE clarifies the types of policy documents that it issues and the methodology used to produce them, taking into account recent methodological developments.